December was an exceptionally busy and exciting month for the museum team. We had our busiest cruise ship week of the season during Christmas, but prior to that, we were fortunate enough to have a ship-free week in which we were all able to get away for several days. A couple of us spent time in Harpon and Maiviken huts and were blessed with incredibly warm and sunny weather (after a few days of snow and wind, of course!). We were even able to sit outside the Maiviken hut in t-shirts and shorts. 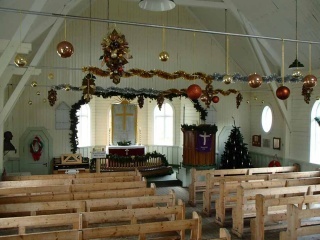 After the welcome days of rejuvenation, we hosted a church-decorating afternoon for the local community (22), with home-made mince pies and mulled wine followed by a dinner for all in Drukken Villa. 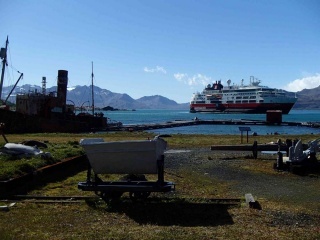 Fram was one of two cruise ships that called on Christmas Day. The following week was a whirlwind of ships and tourists, with some days featuring three ships in and around King Edward Cove. We hosted 9 cruise ships, 1 Royal Navy ship and a yacht over the course of just one week. Some of those were long days, but the passengers, staff and crew were all cheerful and full of holiday spirit(s). Fortunately, we didn't have to find time to cook for ourselves during this week as we were invited out to enjoy several meals on board the ships as well as an incredible Christmas evening feast with our friends at King Edward Point. Fund-raising continues on all of the ships for the SGHT Habitat Restoration Project. We give presentations on board the ships which were very successful during the Christmas week. One of my main tasks this season is to maintain the donor database. I am pleased to say that Sarah's HR presentations, as well as those given by Rachel and I to German tourists, have generated so many Sponsor a Hectare donations that I can hardly keep up with the administration. Luckily it quietens down in February and March so we will at last be able to get on with some of the other projects and maintenance for this season. The Curatorial Intern, Deirdre, has created a new tour in recognition of the 100 year anniversary of Sir Ernest Shackleton's Trans-Antarctic Expedition. The Shackleton Tour focuses on locations, anecdotes and artefacts that help to tell the tale of Shackleton's epic journey and rescue operation in 1916, especially as it relates to Grytviken. So far, the tour has been enthusiastically received. 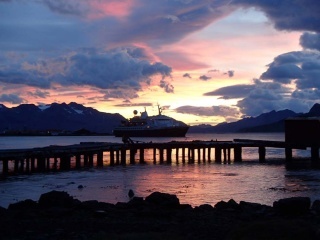 All of us at Grytviken wish you and yours a very happy and healthy 2015! Sea Adventurer at dawn on Boxing Day. This page was last modified 17:19, 3 January 2015. This page has been accessed 6,768 times.